Llewyn Davis takes refuge in the apartment of his scholar friends, the Gorfeins. The following morning, as he leaves the place, the Gorfeins’ cat slips through the door and is locked out of the apartment. He’s forced to take the cat with him, eliciting stares and smirks on the subway. Llewyn Davis is the quintessential starving artist, who would rather crash at his friends’ homes than take a mundane job. He doesn’t even own a winter coat. All he has is his guitar and the unwanted cat—until it escapes from his grasp. He wants to stay true to his art. He scoffs at the commercialism of a song written by his friend, Jim (Justin Timberlake), though he agrees to record the song with Jim and another singer, in exchange for $200. Llewyn Davis travels from New York to Chicago to try his luck with an agent and back to New York after he fails. He meets some strange people along the way, such as the drug-addicted Roland Turner (John Goodman) and his driver (Garrett Hedlund) and a harsh Chicago agent (F. Murray Abraham). But he persists. The movie ends the same way it started: He sings in a club and gets beaten up afterward. Even the lost cat returns home. Like the cat, Llewyn Davis has nine lives, and I desperately hope that he will make it someday. 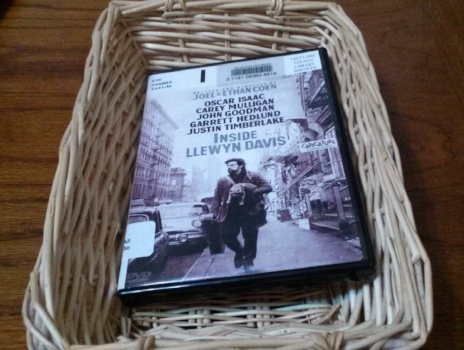 Llewyn Davis is a classic Coen brothers’ hero—a likable loser like the Dude in “The Big Lebowski” and H.I. in “Raising Arizona.” Llewyn is bleaker than the other two, but he’s just as sympathetic. It takes ample talent to turn a simple scene in a recording studio into a laugh-out-loud scenario. The recording of “Please Mr. Kennedy” is one of the funniest scenes in the film. It also takes the musical talents of T Bone Burnett and Justin Timberlake to provide just the right comic song to make the scene work. I love the Coen brothers’ sense of humor and singular vision as filmmakers, both of which are evident in this movie. In the hands of less talented filmmakers, Llewyn Davis would probably be just another “starving artist” stereotype. But in this movie, he’s a deeply moving and funny protagonist. I’m not a fan of folk songs or folk singers, but Oscar Isaac made me listen intently because his singing is a revelation. He gave fine performances in movies like “Robin Hood” (directed by Ridley Scott, 2010) and “Drive” (directed by Nicolas Winding Refn, 2011). In this film, he shines brightly. There are many reasons to watch this movie: the bitter-sweet comedy, great music, superb acting and singing, and of course, the Coen brothers.